Big Yeah! of the day; I have been officially accepted into a masters program! The University of St Thomas evening MBA program will be the new subject of where all my time goes. I hope to get it done in 4 years. Birthday breakdown; It was an odd day overall. A family member in NY, who is and has been very sick for a long time, is now very very sick and decided to sign the DNR so there was much talk about it all weekend. We will all miss him tons and he was a major part of my life until I moved away and even then he would mail little random clippings from newspapers or silly e-mails. I’ve said prayers for him to be comfortable and happy for years now and I’ll keep it up until the end, but it is a birthday bummer. I really did it to myself because I just kept thinking about him, then I started thinking about what if other people die, or Lars, or me, and it is a weird personal gloom I set on myself. Lars has gotten used to these (I think) and I really do get better – today I’m totally normal just regular sad. I did get a cool new game from Lars and we played a round with friends who took us out to lunch and then Lars and I played a round. I need to look at the box to get the name but I highly recommend it. I was a veggie most of the day, we watched some tivo, I read, I refused to fold laundry but we did some general cleaning and wrapping and I ended up going to bed a little early. Today I picked up donuts for the office. I originally thought it was weird to bring in something for your own birthday – so 1st grade – but it really does make sense. 1. if you don’t want to mention your birthday you don’t have to 2. nobody gets stuck organizing all the office birthdays 3. no wondering if people will remember. All good reasons to bring in donuts yourself if you want the world to know. I share my birthday with a guy in my group so it was even more fun. In the grand scale of birthdays I would put it somewhere in the middle – My 16th I think is at the top, 13th right after and the ones that I had the flu for are at the bottom. Unfortunately I did not get the pictures of the rest of the house done yesterday but I’ll give it a shot tonight. For now, here is a little flicker group of Christmas decorations. (click on this picture to see the others) I re-arranged my sad little tree about 3 times, Lars and I tried to decorate together but it takes effort to make a cheep-o tree look like something and Lars was going for the path of least resistance so there was much ornament clumping. My sister hates it when I rearranged the tree but now we have separate houses on different sides of the mid west so she can’t complain and Lars does not notice that nothing is where he put it. Plan for the week; Finish up the little bits of shopping then we plan on driving around playing Santa on Thursday to our friends. 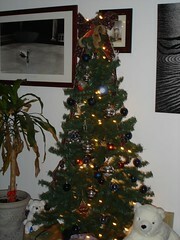 Then we will do our mini Christmas at home before we go to NY for big Christmas. Today is my birthday! 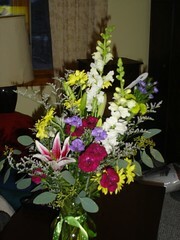 These flowers are from my parents through Lars. He went to the store and the florist asked what he wanted and he said ‘Nothing that says Christmas’ She had nothing so this is a custom arrangement. It smell great, the entire house smells like lilies. I still have no particular plans for the day. I think I’m going out to lunch with friend and fellow blogger JC but other then that not too much. I have been working on taking pictures of our house 1 year later since yesterday was the day we closed and we have done a ton. I have talked about alot of the projects but many didn’t get pictures. Yesterday I did about half the house, today I’ll do the remainder and post. Flicker has been upgraded nicely so it is way easier to use now. So, something to look forward to (if you like pictures) later today. Now, I will go run. So, many days have passed since my last post. As have many hundreds of miles. I went to and from a supplier 4 hours north on Tuesday, then drove 7 hours to a supplier in WI and spent the next two days driving around WI to various suppliers. On Sat we only drove 1.8 miles to the event but Sunday, 6 hours back to home. The event was very fun. We had tons to do and I didn’t get to talk to everyone I wanted to but being princess is still fun. The princess sleeve tournament that I hosted was great. There were well over 30 fencers and I talked to the princess of another kingdom and it was a great time. I like the winner too, he seems like he will do a good job. The 2nd place person would have been cool too but he has won a few in the past and the guy who won will benefit from being seen etc way more then #2 would have. While I was driving and seeing suppliers and going to events my sister had her baby! He is healthy and huge and they are home already enjoying being a family of 4. For about 5 min I was sad that there were no more babies to wait for – my 3 internet babies got born, my neighbor, and my sister are done and that was the end of the list. Yesterday I found out that another friend is a month or so along and then I remembered another person is 3 months along so I’m back in the baby watching game. Maybe next year I’ll have one. Now that I actually worked all day every day plus one evening I am officially caught up at work. There is still plenty to do but I’m not behind anymore. On to Christmas! I finished wrapping and packing and I mailed everything yesterday. I took advantage of the online postage purchase and free pickup and it actually worked. They got more money out of me then absolutely necessary because I added a pound to all my packages to be positive I was covered. The mail man had to brave 6 inches of falling snow to get the packages but when I got home they were gone so I believe it was a success. I was torn for a while, in my mad day after thanksgiving marathon shopping I got a gift for a brother in law and totally forgot that big and heavy are bad ideas for mailing. I went back and forth and the final deicing factor was that I didn’t have a box that could fit it plus the other gifts soooo I bought one online and I’m having it shipped direct. The other one is sitting on my kitchen floor, wrapped, waiting to be unwrapped and returned. I also did the online thing for my sisters baby. I don’t want to pre buy Christmas gifts because he might not have been born yet but after he was born I was already on the clock to ship so no time to shop. Anyway, he is getting a cute Winnie the poo sweater set via target express. I still have a little shopping to do for my family in Sayville but I’m going to be flying there so I am putting off shopping until I get there. This Sunday is my birthday, I’ll be 26 so I need to change my blogger bio. No real plans but I have a little pile of presents from Lars to look forward. He was so good, he actually found non-Christmas paper to wrap them in. To follow up – none of the bedding nor the bed smell like pee anymore. Lars got a great spray by oxyclean that ate up the pee using enzymes. The blanket is getting dry, the feathers are still clumpy but we have hope for a full recovery. The current theory is that there was some sort of animal smell that the cat was trying to cover up. So she was trying to do us a favor… She is a good cat but I think she will stay banned from the room for a long time. Later Monday I had another tragic incident. 2 miles from work I stopped to get gas and the gas pump took 15 min to pump 10 gallons. That was bad but the worst part was that when it finally finished the car would not start. All I got was a click-click-click sound. I called Lars and he said it was probably the battery and he would come jump the car. The worst part really was waiting, it was only 1 degree and I sat for 25min waiting – I was an icecube by the time he got there and by the time I got home I was completely wiped out. Lars and our neighbor replaced the battery yesterday and it was a saga to itself including Lars pulling something off the car that should not have been pulled off. He has a theory that when something isn’t working to push, pull, or twist harder – this theory has obvious problems but he always gets jars open. Anyway, the car is fixed and Lars has been declared handy for the week. Tomorrow – Friday I’m going on my first mostly alone business trip. I’m going to Milwaukee and I will see 4 suppliers in 1.5 days. I’m meeting a coworker for one of the suppliers but the others I will be on my own. There is an SCA even in the area on Sat so Lars is going to meet me there Friday night so get work done plus a ‘free’ trip I would have needed to go on anyway. The event is one of the bigger winter ones and the Prince of the Middle and the Prince of Calontir are both going to be there so it will be fun for Lars to fight and plan for Pennsic. My favorite part about winning the crown we did is we get to be King and Queen at Pennsic. Last – on the 9th I will have had this blog for 1 year and this is my 200th post. This time last year I wasn’t working at my new great job yet, we were closing on a house in 2 weeks, I had only been married for 1 month and we only had 2 cats. Alot more changed too – I cut my hair super short, Lars won crown, my sister got pregnant and has almost had the baby (due any day now), all the internet people I started reading that were pregnant have had their babies and so has my neighbor. I have made a bunch of new friends at work, Josh has dated a girl for an entire year, a whole lot of my friends got married…. busy busy year. Some things that have not happened; did not manage to buy a couch, never got around to a honeymoon, and we still have 2 mostly empty rooms in the house. I’m not sure what I’m going to do in the next 12 months but I’m sure I’ll blog about to some degree.